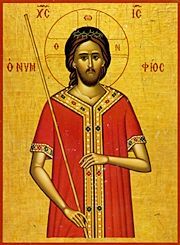 The Procession with the icon of Christ, the Bridegroom of the Church, takes place, and we re- member the righteousness of Joseph who, like Christ, suffered unjustly with patience. We remember the example of the ten virgins waiting for the Bride- groom. We remember the woman who anointed the head and feet of our Lord, wiping them with her hair, in contrast with Judas and his be- trayal of Christ. The Hymn of Kassiane expresses these contrasts with profound poetry and majesty. We are anointed for healing of soul and body as Christ was anointed in anticipation of his burial. All should have made their confession before this point. We walk with our Lord through the Passion. A procession with the Cross commemorates Christ’s voluntary Crucifixion. We join Joseph of Arimathea, Nicodemus and the Myrrh-bearing Women to sing in Praise of the buried Christ, and we process with the Bier and passing under it as if joining Christ in the tomb. As we keep vigil, the Victory of Christ over death and his Resurrection ‘explodes’ with throwing of the leaves of victory. Please bring your children to this service. RUSH/MATINS/LITURGY, 11 PM HOLY PASCHA! We receive the new Light and the Good News that “Christ is Risen.” Please bring dyed-red eggs. You may also bring Easter Baskets to be blessed for enjoyment and sharing after Liturgy. Our parish will also serve additional food to break the Fast. The Good News (Gospel) of the Resurrection will be proclaimed in as many languages as possible.. Easter Egg hunt to follow.